It wasn’t the way he had planned it, but He planned it perfectly…. Now, for you sane, non-horsey folks out there, a Friesian is romance and power on the hoof. Remember Goliath in LadyHawke? (That movie had its way with me during my most formative years….) Remember ANY big, black, dancing horse with a mane cascading down to his shoulders and a tail that tames the wind? That’s a Friesian. Friesians are a rare breed from the Netherlands, decendents of warhorses of old. They have a direct link with those primal curls in our DNA that make us realize happily-ever-afters are destined to prevail. I cannot remember a time I didn’t long for one of my own, with every fiber of my being. Most of you knew my old horse, Knight. In his heart and mine he was a Friesian wannabe, and the embodiment of a dream of chivalry, romance and unity between a horse and his person. This summer, I had to put him to sleep. A piece of the dream went with him. Back to the present, back to reality. Mark shocked me when he started sending me links to Friesians for sale. He’d call from work and we’d run YouTube clips, tears streaming at the raw beauty of the breathtaking horses. 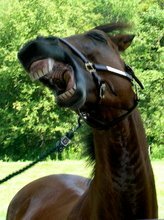 “Don’t you DARE even think about buying one…” I’d tell him, and follow up with a handful from among the 976 reasons we DON’T need another horse right now, especially a Friesian. Looking at the price tags on mature, saddle-trained Friesians, he agreed. But Mark was committed to making a dream come true. Now, we were also hunting for the perfect first horse for him. In my mind, that was top priority. 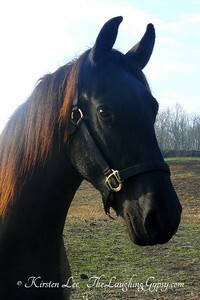 He was looking on a Virginia horse classifieds site for Shires for sale, and did a search for Friesians… “just for fun.” That brought up the ad for Testimony, a yearling filly whose owner was going back to grad school. “She is our firstborn filly and a dream come true, a Testimony to God’s love and grace,” her owners wrote. “We will choose her new owner from among interested parties on November 1.” It was the first of November. The front page of the Friesian’s website reminded me, “delight in the Lord, and He will give you the desires of your heart.” I watched the videos of the filly and her mother, sobbing, already feeling the hands of fate. Mark had emailed the owners an eleventh hour plea. “Coincidences” began to pour like rain. We were heading down to that area on Mark’s next day off to look at a couple of horses for him. Mark insisted we at least go meet the horse and her owners. With all the signs and coincidences leading up to this moment, and with full realization that marriage was now galloping into reality, we were both shaking by the time we arrived. The filly was every inch a beautiful princess–and she knew it. The horse trainer in me appreciated her regal bloodlines and her exceptionally free movement. 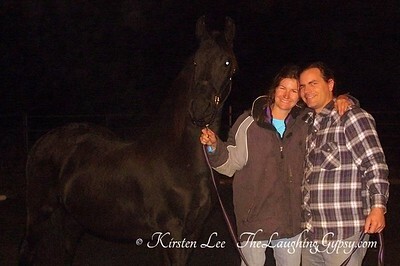 I didn’t feel “IT” though, the warm oneness when you know you and your horse are together together. “That makes it easy to say no,” I told Mark. We talked. We thought. We prayed. The only thing God would tell me is, “be still and know that I am God. Be still and wait on Me.” Not words to overjoy a type A personality in the face of a huge decision, but strangely comforting. Perhaps this decision was not meant to be mine. Meanwhile, I got a call from an old friend, Tam. She wanted the freedom to move to China. She wanted to do right by her horses. She wanted them to come back home to the Bower. More horses. Wonderful horses. 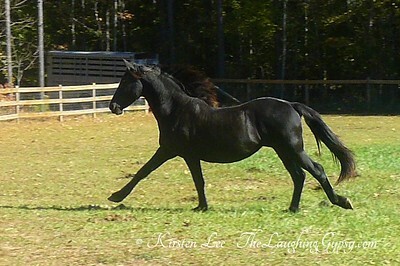 Angus, my first-born colt, now 3 years old. Pete, the patient Appaloosa who loves medieval games. TC, who I worked with before I even moved to the Bower. 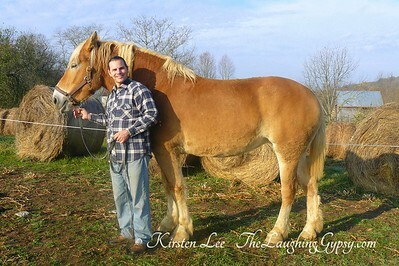 And most amazingly, Dolly, the perfect horse for my Love. Dolly is 17 hands of golden Belgian. As Mark pointed out, “she’s so big if you want to fall off you have to bounce at least 3 times across her back before you run out of horse!” She is a champion charger for my shining knight. His face lights up when he even talks about her. Back to the Friesian, back to our Testimony. When last we left off, I was obediently waiting. (“I HATE waiting!” ~Inigo in The Princess Bride.) I was trusting my LifeMate to make the right decision for the both of us in a situation that defied logic. Mark grew ever more adament, and I watched a dream emerge from a fog of fear and disbelief. We went to pick her up Tuesday. I was beside myself with joy, with excitement, with the hugeness of the situation– but still no warm fuzzies between the filly and I. In the hubbub of sealing the deal, emotional greetings– and good-byes– and trailer loading a nervous, excited youngster, Mark didn’t have the chance to carry out his well-planned proposal. The trip was pleasantly uneventful and brilliantly lit with blazing foliage bright against stormdark skies. The filly settled into the rhythm of the road and long hours eventually brought us home. I’d just turned the rig onto Bower Road when my cell phone rang. Ginny was up at the Head of the Grove. Bold Step had been picking on D’Art, who fled through the fence. Ginny was starting the fence repair while D’art ran around the adjacent pasture, evading capture. I laughed at the ironic perfection of the situation. We might own a fancy Friesian, but we still gotta fix fence on a rainy night! We settled the filly in the roundpen with hay and water. Mark had some things to take care of in the house, so I headed up to deal with fence. D’Art is such a mama’s boy– he stopped running and let me come right up to him in the dark. We got the bulk of the repairs done and I sent Ginny back to the barn while I finished up. The crescent moon was leisurely sinking towards the horizon. It threw just enough light to set the ground-hugging mists aglow. The horses stood in silhouette along the hillside. Wow, I thought, this might be the last time I stand here as a single woman. I started up a conversation with God and soaked with Him in the still majesty of the night. As I was heading back, my TrueLove emerged from the darkness. I brought him back to the crest of the hill, where the moon danced ever closer to the treetops in the Old Old Orchard. We held each other a while in the mist and moonlight, then Mark sank to his knees. Never in time has “will you marry me” been wrapped in such splendor and love! We went back to the barn to tell Ginny and play with the new filly. Since my engagement Friesian doesn’t quiet fit on my hand, Mark wrapped an electric fence zip tie around my finger–in matching black. We spent the evening calling family, reveling and toasting with the last bottles of a raspberry melomel he’d racked 3 years before. The next morning, the filly let me know she was Grace. She sighed and lowered her proud head against my chest for a long hug. If she had done this when first we met, I’d have fallen in love in a flash– and always would have second guessed if we made the right decision. In tough times I’d have doubted destiny and chalked it up instead to the starry-eyed dreaming of a horse crazy girl and the amazing man who wanted to make those dreams come true in the face of improbability. It had to happen this way, just as it happened with Mark. There is no question in either of our minds that we were meant for each other since before time began. And there is no question in our minds that Grace is meant to be in our lives. Greater forces than ours are at play. We don’t know what the future brings, but we can’t wait to live it! Happily Ever After begins now…. I love it! All the best and GOD bless you both in your new life together. Keep hold of the faith, Love always- Krissy. can't wait to see that black ring in person!